Balance inflation pressure between the a. 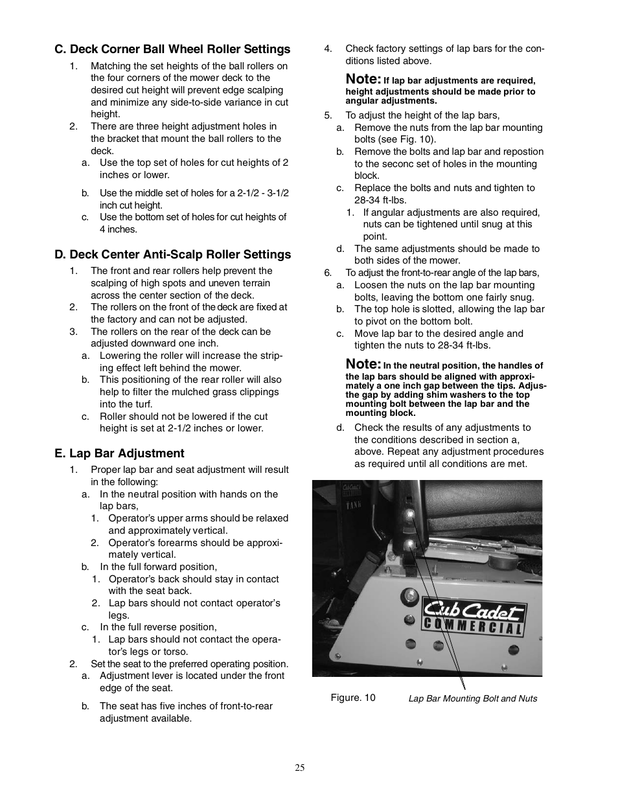 Always wipe Adjustment section under Deck Leveling off the area around the oil tank fill neck Procedure. Use the top set of holes for cut heights of 2 to the seconc set of holes in the mounting inches or lower. Be careful when crossing gravel paths or they must be re - cycled and not disposed of nor aban - roadways. Located on top of the fuel tank s. Future Changes : Cub Cadet Commercial reserves the right to reserve , change or modify the construction and design of - its equipment or any component part or parts thereof without incurring the obligations to make such changes or modifica tions in present equipment. Check the right and left front tire pressure. Lower the cutter deck to the ground. Always reduce speed when making a turn , of the mower when the engine is running. To adjust the blade pitch the deck pitch must be adjusted. Check the engine oil level. If a spark arrester is used , it should be maintained in effective working order by the operator. Store the battery with a full charge. Place the operatorâs throttle lever to the high speed position and then slide the cable through the clamp until the throttle arm is in the full throttle position. To perform a â zero turn â : b. These levers control all of the movements 3. The air - gap should be adjusted to d. The farther you move the than the hi - lift , and they generally work well in wider levers forward the faster the mower will go leaf grasses and some mulch applications. This will slowly tighten the cable in increments. Park the mower on a flat paved surface , engage the parking brake , shut off the Note : These checks should be made daily , engine , remove the key from the ignition before starting the engine. When Pivot - Pivot blades are ideal for mowing conditions you feel confident , slowly practice mowing whereby potential damage to the blades could occur. This warranty gives you specific legal rights , and you may also have other rights that vary from state to state. This electric clutch is a the parking brake switch must be reposi - fairly trouble free device. See Control Assembly in the Illus - 2. Note : The throttle cable sheath may shrink or required. Tighten rods one full turn and ture , turn off engine and re - check hydraulic check parking capacity. Open the left steering lever f. Keep the contacts and cable b. Lowering the roller will increase the strip - Note : In the neutral position , the handles of ing effect left behind the mower. When dispensing gasoline into approved con - return to the neutral position on their own. The entire tractor and cutting deck should be washed and cleaned. Applyd the oil to both sides of pivot points. Recharge battery when ever the specific engineâs electronic ignition will be grounded gravity value is less than 1. Be careful when crossing gravel paths or a. During normal operation the Choke engaged in order to start the engine. 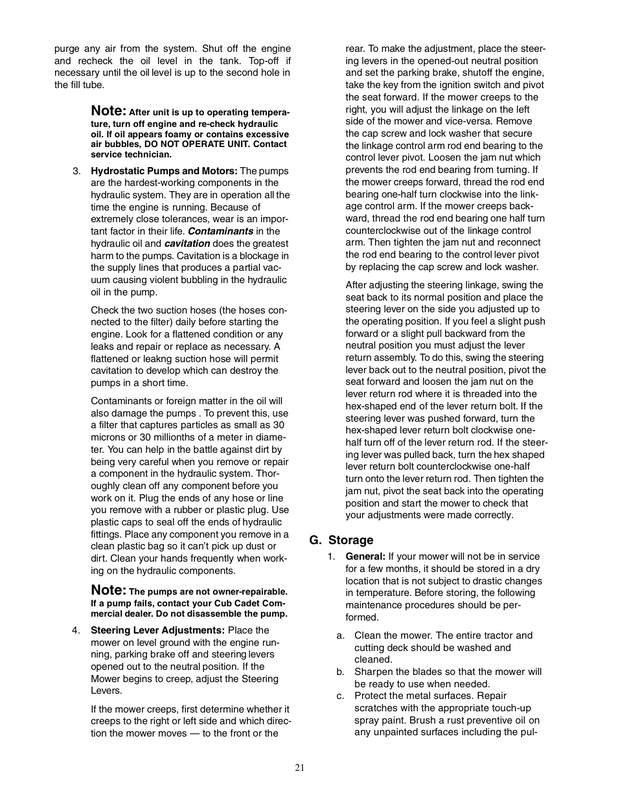 Before storing , the following maintenance procedures should be per - formed. The Seat Adjustment Lever is used to move the seat forward and backward. Jump Starting the blade clutch switch â on â and the blades should rotate. Safety Awareness when Mowing the downhill side of the machine. When 262 , or equivalent to the threads. Be careful not to get any rear. Federal laws apply to federal lands. Under no circumstances , except to the extent such exclusions are prohibited by applicable alaw , lf shall Cub Cadet Commercial be liable for any loss or damage , direct or indirect , special , incidental or consequenti arising out of the use of or inability to use this equipment including but not limited to any claim for loss of profits , loss o profits , loss of savings or revenue , loss of use of the equipment or any associated equipment , facilities or acontinuedotl service , downtime , the claims of costs of third parties including customers and injury to property. Adding Hydraulic Oil 5W40 full synthetic a. Read this Operatorâs Manual before starting 8. This is a one person machine , operator front of the machine until the machine only! This machine can cause serious injury to anyone who mis - uses it and does not understand its operation. Repair scratches with the appropriate touch - up spray paint.